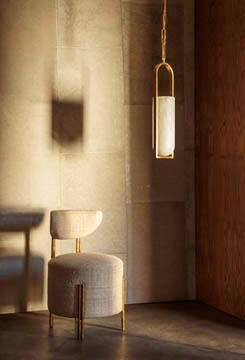 This low chair or stool combines a few simple volumes and textures to create a dramatic piece of occasional seating. The drum seat meets a vertical back that becomes the rear legs and the front of the chair sits upon a pair of thick cylindrical ribbed legs. This is an ideal seating option for a vanity or in a casual living room arrangement. Leg finish options include Bleached, Natural, and Ebonized Oak. Available in a selection of curated fabrics and leathers.